Well! 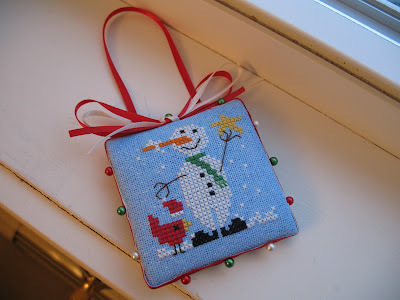 It's about time that I posted some of these ornaments! 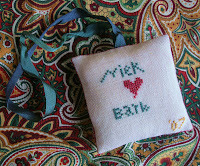 They were all great fun to stitch and finish. 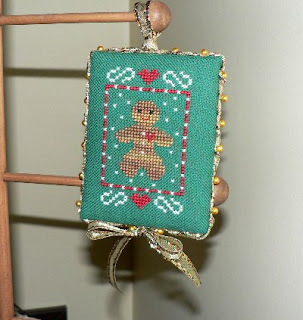 You can see that I was partial to the flat pinkeep style of ornament. Who would have guessed that they were this easy? 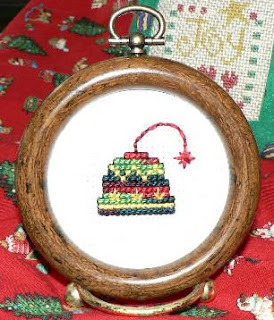 As much as I love the Christmas and all the preparations, I haven´t had time to stitch ornaments because of all the other exchanges I´ve participated in. 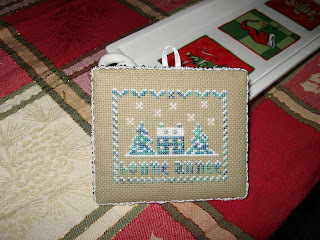 Well, these are the ones I have stitched in November and December. Both of them presents for friends. ... ornament in this year. I hope it will be more next year! 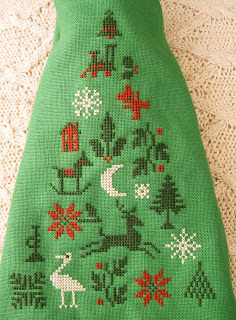 This is "Christmas spot sampler" (eef). The recommended threads are not in my stash, so I used Anchor-threads, one over two on Edinburgh-linen (Zweigart, antique white). Please welcome Jennifer as the new administrator of the SAL blog! 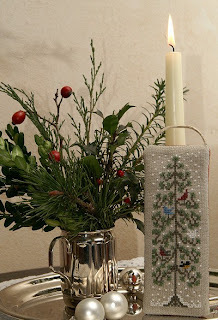 She has offered to help and has some lovely ideas to hopefully inspire you in the coming year. I will still be around but she will be taking over adding members etc from now on. Barbara has also very kindly offered to help, though she has her hands full with a lovely Christmas baby right now! Please give Jennifer time to get settled in and a big thank you for helping out! This is my first contribution to this SAL. Pictured is the front and the back. The size difference in the pictures has to do with my photography. The main poinsettia design is from Prairie Schooler. 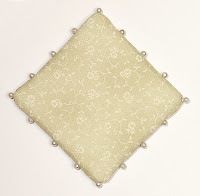 I added a leaf design in the corners and used the smaller green design on the front to make a coordinating back. 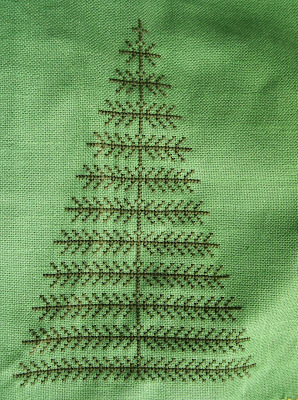 It is stitched on 18 aida. Making the biscornu was a challenge, but I would definitely make one again! 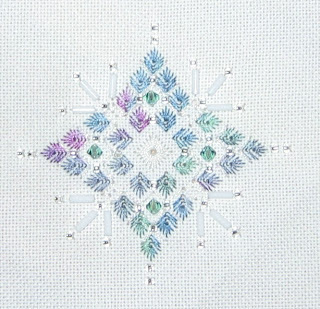 This is "Sapphire Star" from Patricia Ann Designs (2004 JCS Issue). I stitched it with a Dinky Dyes Silk, and erinite coloured crystals on mystery fabric. 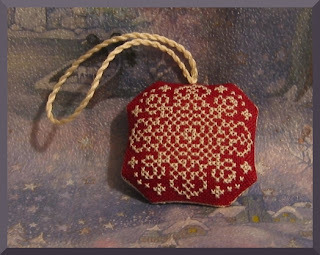 Finally I have to show another christmas ornament: "First snow", a Drawn-Thread-Freebie. 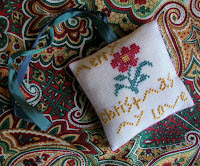 It's a christmas gift for my stitching friend Anja. 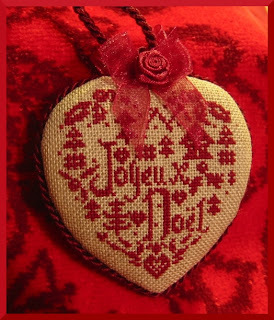 I hope you'll like it too and wish you all a merry Christmas. .....of TPS christmas trees. Merry christmas to all of you, see you again next year! I haven't posted for a while but thought I'd share this last ornament with you all. 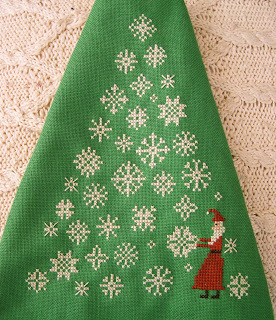 I do have one other which is stitched and not finished but since it's now 5.30pm on Saturday, I don't think it will be finished before Christmas. So this will be it for me for 2007. Merry Christmas everyone! Hi, all. Here are my bottle cap ornaments I made this past month or so. These are a lot of fun to do. You can find the instructions at Camilla's Place. I've finally got an ornament to post on here. I made this for my grandgirl. 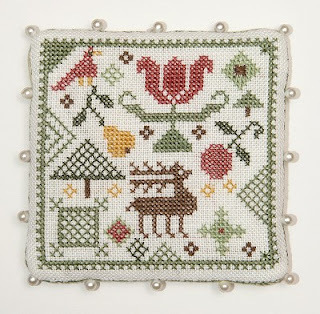 The design is by Lorri Birmingham and from the Leisure Arts Big Book of Christmas Quickies. 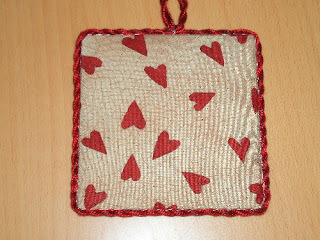 I like stiching ornaments with red colors. These are the Lili Points and Anael Designs (French Designers). 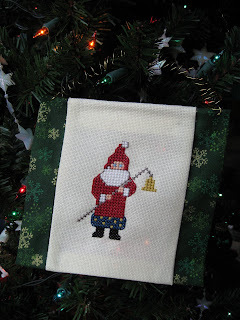 I stitched a design from The Sampler Girl (Merry Christmas My Love) this year for my DH, using VC silks on a 40 (?) count coffee-dyed linen. I just love how it came out. I made up the personalization on the backside. 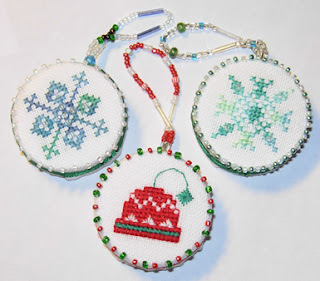 Here are the three ornaments I've stitched for the kids for little surprise gifts. 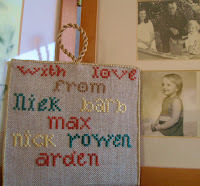 I'm going to make them a special ornament each Christmas from now on, as I also do for their wonderful Daddy. Normally, I avoid aida but I just loved this deep, rich Victorian red. All three are stitched in either DMC or another colorfast floss for washability. 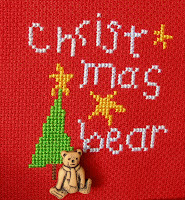 ;) The talented designers are, from top to bottom: "Christmas Partridge" by Stacy Nash Primitives (Rowen's ornie), "Dash Away All" by The Sampler Girl (Max's ornie), and "Christmas Bear" by Beth Hendzlik (Nicky's ornie). Other than Rowen's ornament, I used my own choice of colors rather than those suggested, and made various other little changes. Here is another ornament finish for this year. 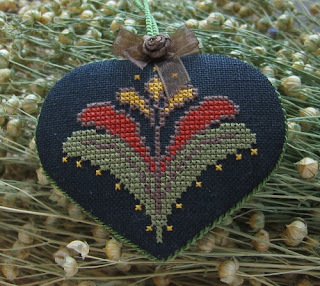 This is Victorian Lace Snowflake and it's designed by Rosewood Manor (you can find it in this year's JCS ornament issue). 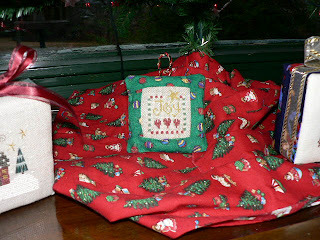 I changed up the fabric and threads per my notes below the picture. Here's a little 'perpetual Christmas card' that I sent off to my Mom yesterday. 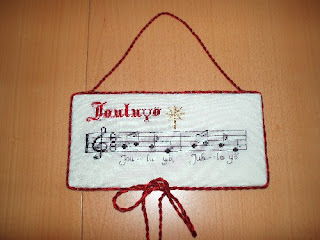 Hopefully it won't hit a snag in the international mails and will arrive in time to hang from one of her windows (or wherever she decides to hang it - LOL!). 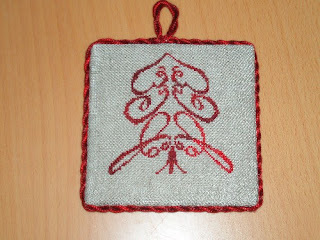 The front side is based on an old Barrick Samplers design, but has been reworked for Christmas. 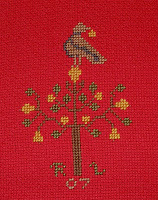 The backside has all our names, using an alphabet very loosely based on a Brightneedle alphabet. Hello, I'm also new to the group. I'm Jennifer from the East Coast of the US. 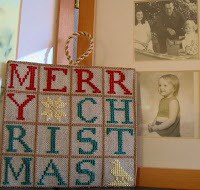 (You can check out my blog at http://sweetpeastitching.blogspot.com/ for more about me). 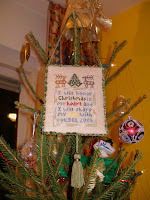 My husband and I love to visit lighthouses and I stitched this one up for us this year. Design from Treetrunk Designs "Guardians of our Waterways"
I posted the semi-finished version before, but here are three of my snowmen in their completed version. They are sitting on their backing fabric. 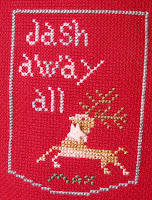 Happy Holidays and all the best in 2008 to all of my stitching friends!